While John McCain is still learning how to use email (we’re not kidding), his U.S. Presidential competition has completely mastered the micro-blogging service Twitter. 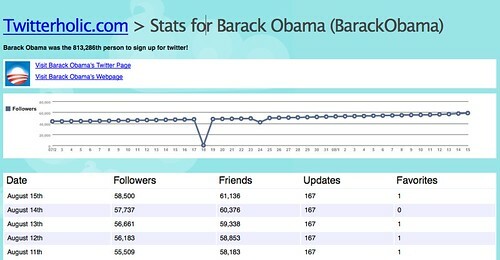 This month, American presidential candidate Barack Obama dethroned Kevin Rose from Digg.com and became the most popular person on Twitter. According to Twitterholic, a website that measures the “followers” of Twitter accounts, Barack Obama has over 58,000 followers. Obama’s closest Twitter competitor is Kevin Rose with 56k followers. Robert Scoble, CNN Breaking News and Leo Laporte help round out the top 10. Someone not in the Twitterholic top 10… John McCain. In fact McCain isn’t even in the top 100. The only serious McCain Twitter account we found has a little over 1,000 followers. A truly pitiful showing for someone who is running for president. Here’s a 101 primer on Twitter and tips on how to explain it. If someone who personally knows John McCain is reading this, please print the article out for him (because you can’t email it to him yet).